Gallery update #4 – Game of Thrones! 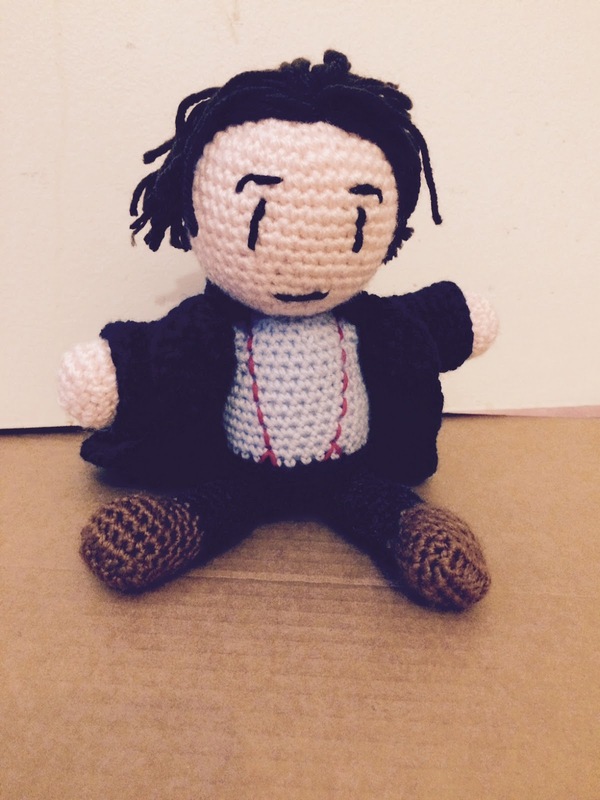 Another gallery update, here’s my Firefly dolls! All made for the Vancouver Can’t Stop the Serenity charity auctions on various years. Mal, Kaylee, Jayne, and Zoe dolls made for the Can’t Stop the Serenity charity auction a few years back. 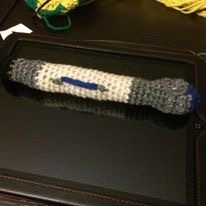 Using Pixelated Mushroom’s Doctor Who pattern as a base. Jewel Staite before the auction! I asked my friend who organizes the even to take a picture of Jewel holding the doll she just signed – and then I printed out the picture and took it to Phoenix Comic Con with me a few weeks later where I had Jewel sign the photo. Of her holding a doll that I made that she signed. Layers! It now lives on my fridge. Kaylee, and Jayne for this year’s Can’t Stop the Serenity auction. 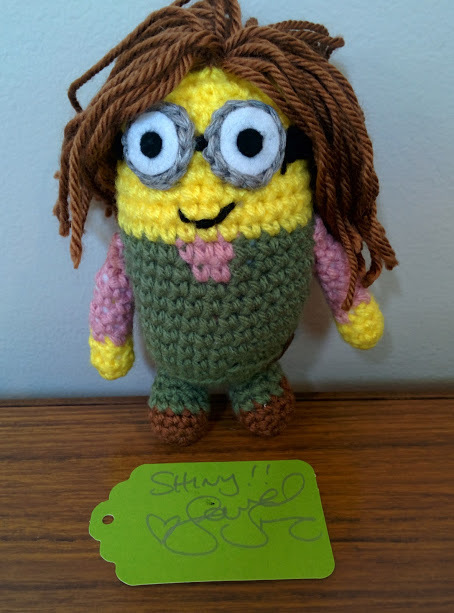 Minion!Kaylee had a little tag signed by Jewel again. 🙂 Maybe one of these days I’ll see her at a con again and get her to sign this picture lol. 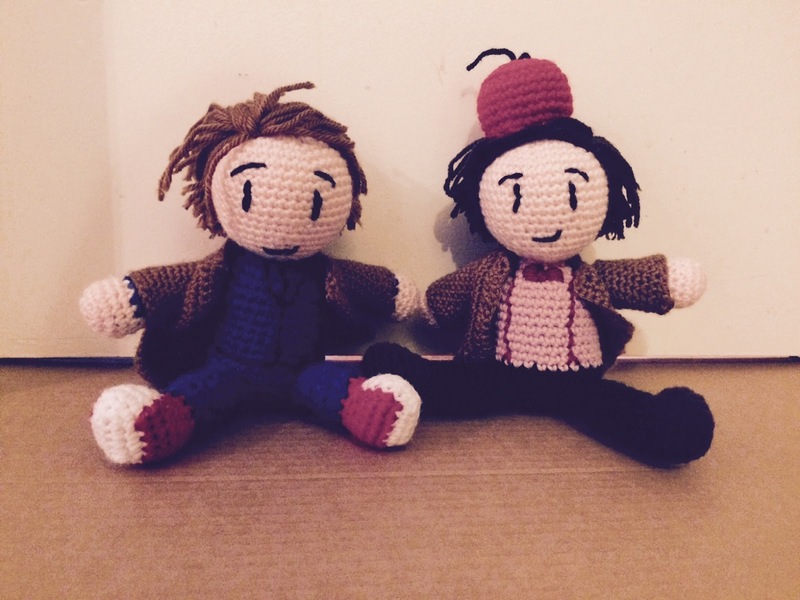 Continuing to get all my dolls posted on here… Doctor Who! there WAS a right vs wrong side. And the embroidery is… kinda special. 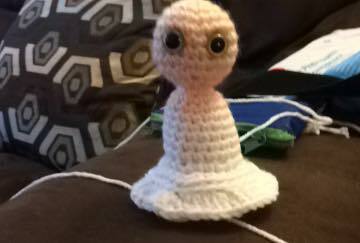 Another early project – an Ood! For a friend who really liked the Ood. 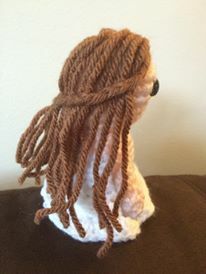 I used a Cthulhu pattern as a base (this one from Cthulhu Crochet to be exact) and then kinda just winged it as I went. young to teach her daughter to be the next Doctor. Pattern from Louie’s Loops. Hi everyone! Sorry for the long delay between posts – I was in Nova Scotia in September (expect lots of Groot photos from that trip at some point), and October… well honestly I don’t really have an excuse, other than the fact that I was trying to get a bunch of projects done and just haven’t gotten around to the blog. That’s changing today – I’m spending the day getting photos of all my dolls (from the old to the new) posted into our Gallery so they are all archived and easy to find. And while I do that, I figured I might as well make each page into a new post as well (with extra comments/notes and some bonus silly pictures that I didn’t include in the gallery). those ones), or to be lopsided. Or both. 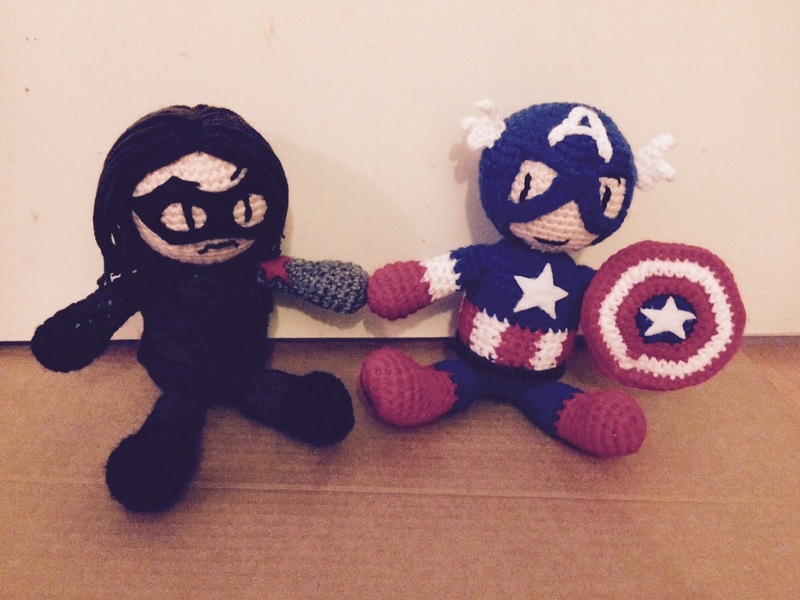 Hawkeye – the first in a series of small Avengers dolls I made a few years back. 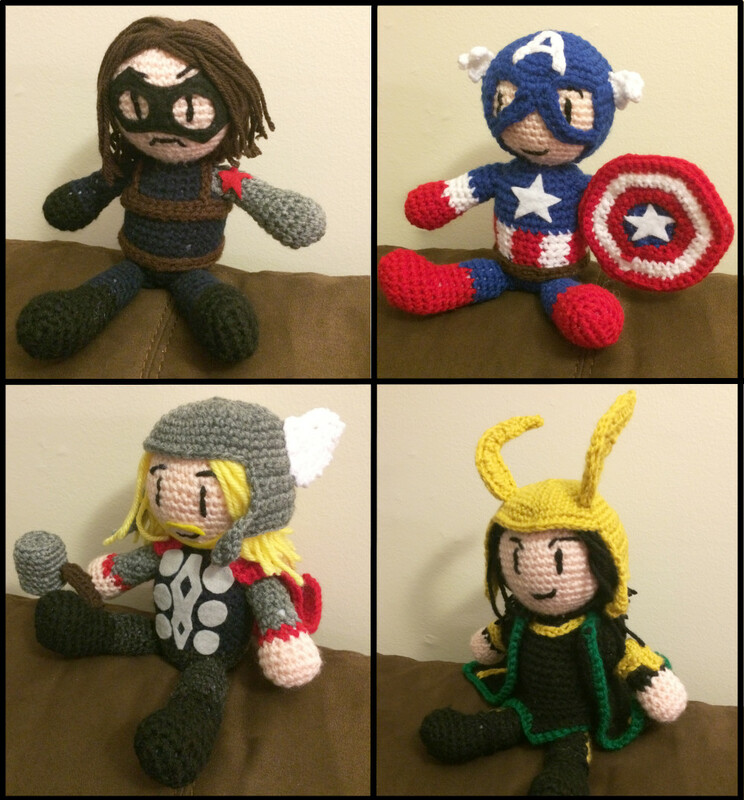 They’re all a bit funny shaped; I was winging it and I made their torsos too round… so this is basically a series of Avengers dolls who have let themselves go to seed a bit. 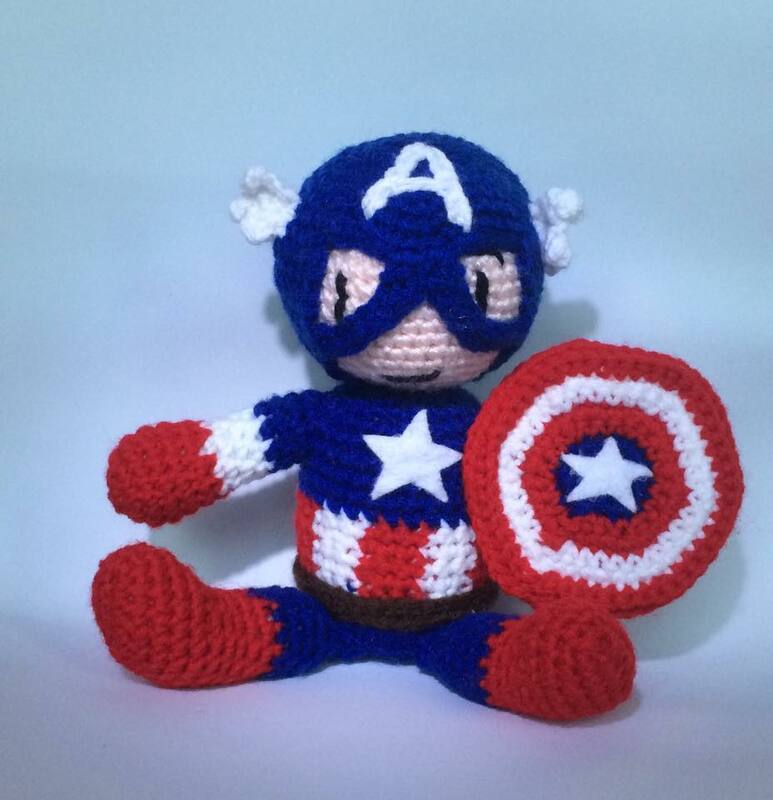 Captain America – he’s definitely the most chubby of the lot lol. Oops! and 5 small Groots that are just cuddly and have nothing pointy or hard. made the rest with a light brown which I think looks better. 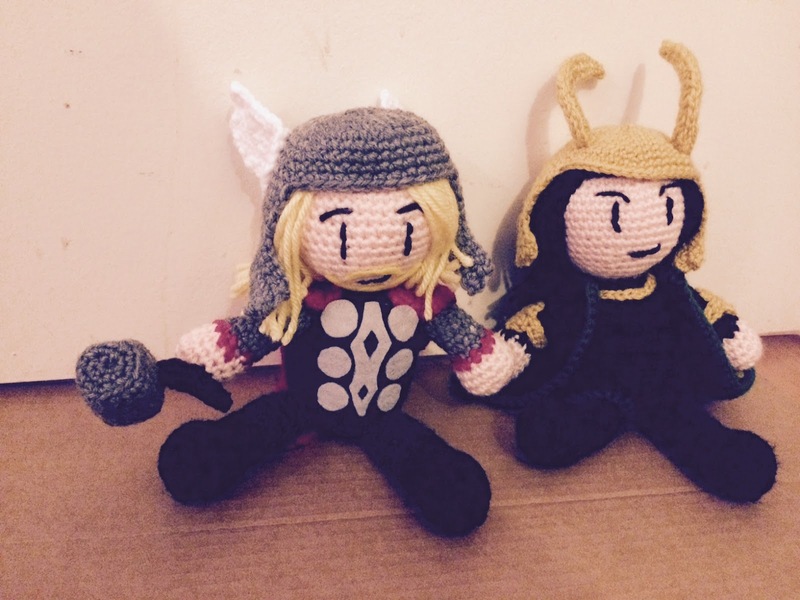 Thor Minion and Captain America Minion! 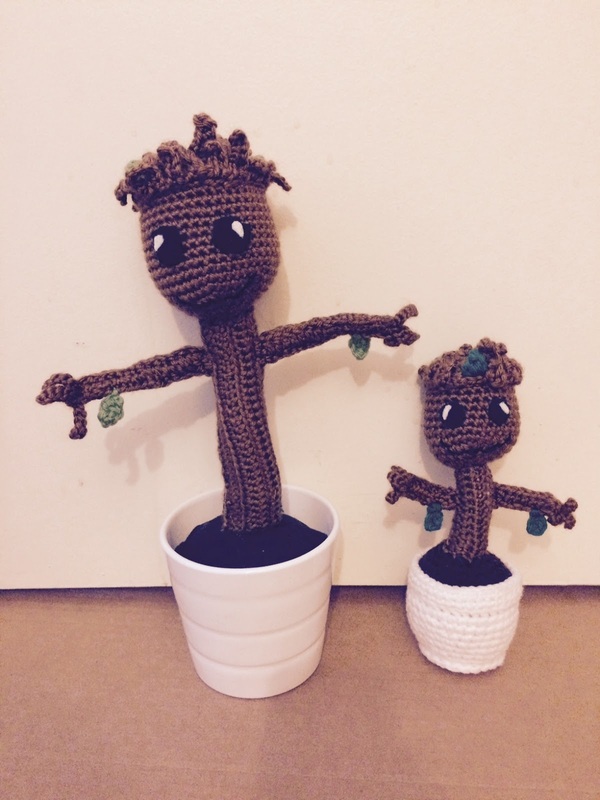 My first Groot, made from this pattern at Smartapple Creations. 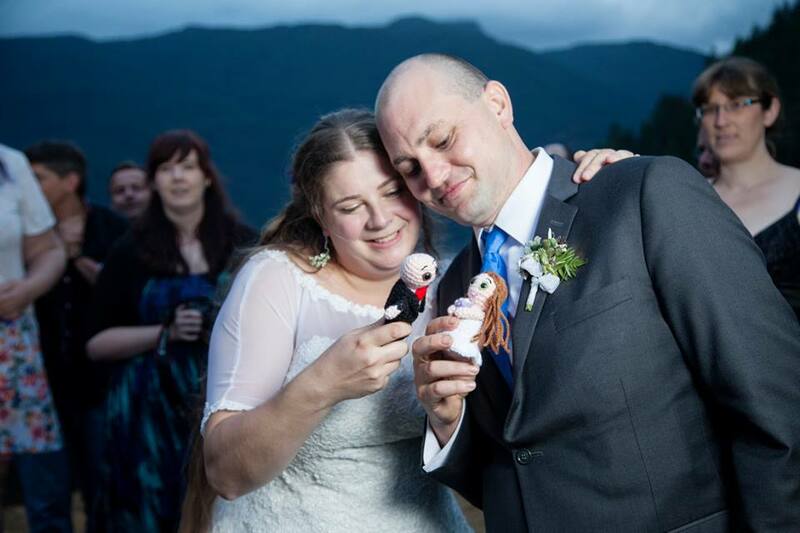 time I wanted to try my hand at a more traditional bride and groom set of dolls. the pattern so I decided to go at it alone. to wear her hair. So that’s something! Kate doll attempt number 1. Not exactly a success. ended up a little… lopsided… but still cute I think. you to decide if I captured their likenesses or not. Making them kiss – aww…. Welcome to my first in a planned ongoing series of posts: Baby Groot Around Vancouver! (and occasionally other places). I first designed my baby Groot pattern for FanExpo Vancouver in April 2015. 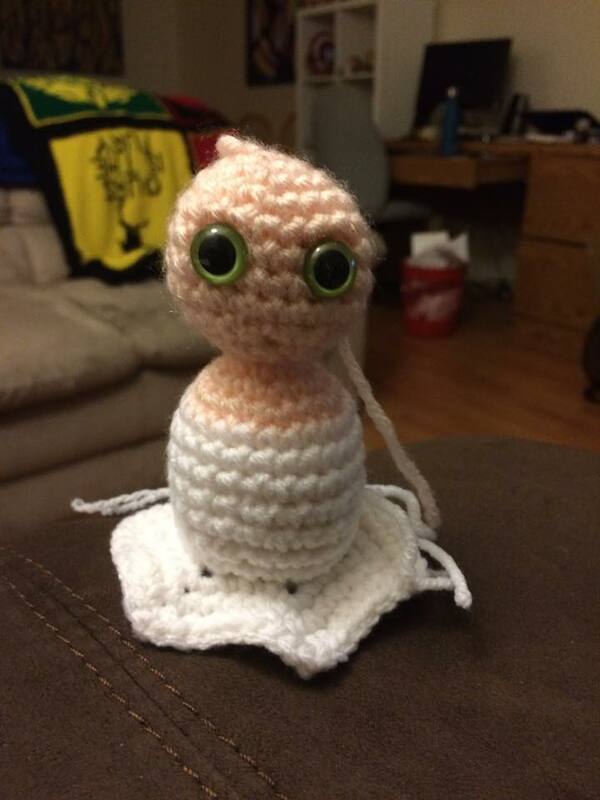 I had made a baby Groot the previous September for a friend’s birthday, but it was based on someone else’s pattern and this time I wanted to do my own. FanExpo was my first convention post-Guardians of the Galaxy, and I knew right away that I had to make some baby Groots – hard to go wrong with them! I made two large ones to start with and used wires so they would be posable, and then stuck them into actual pots. They’re cute, but one of my friends commented that it would be nice to have a cuddly baby Groot, one that you could give to a child or take to bed with you (platonically, geez). I resisted at first because I wanted Groot to be able to stand up on his own, and a stuffed pot wouldn’t stand up as well without something to weight it down. And the whole point was to keep it totally soft and squishy, not to mention I haven’t personally found that those little plastic pellet weights do much of anything…. I thought to myself, though, ‘hey, he would be small and probably pretty quick to make, and if the point is to make him small and cuddly then it doesn’t really matter if he stands up, right?’ So I gave it a go and ended up with this little guy. The original soft Baby Groot! Now, I’ve been trying to think of ways to take more interesting pictures than the one above, which is Groot in my living room. Woo hoo? So I decided to take pictures outside, first in the garden of my parent’s house on Bowen Island. Then I started taking more pictures – Groot on the ferry (see our header! ), Groot at the lookout point near my parent’s house… and I realized that a fun idea would be do to a Baby Groot Travelogue! Mostly of Vancouver and the surrounding areas for now, though that will expand eventually (New Zealand in March… Baby Groot at Mt. Doom, wait for it!). Because hey, my job is selling Canada as a destination and Vancouver is my city, so I may as well! Which brings us to post number 1. These were taken on a day trip with my friend Amanda about a week ago. We didn’t end up getting as much done as I’d hoped because we weren’t feeling great and decided to cut the day short, but it’s a start. I also struggled a lot with photo quality – Groot kept coming out way too dark against the background because it was such a sunny day. I’ve tried to do some colour correction on the computer, but it’s… not working so well. But I will press on and hopefully get better pictures next time! Canada Place with a cruise ship in port, and the mountains in the background! I gave up on trying to take pictures of Groot in front of the background (he ended up completely dark each time), and switched to taking some pictures of him in front of the giant maps inside the lookout. I don’t know, it amused us! 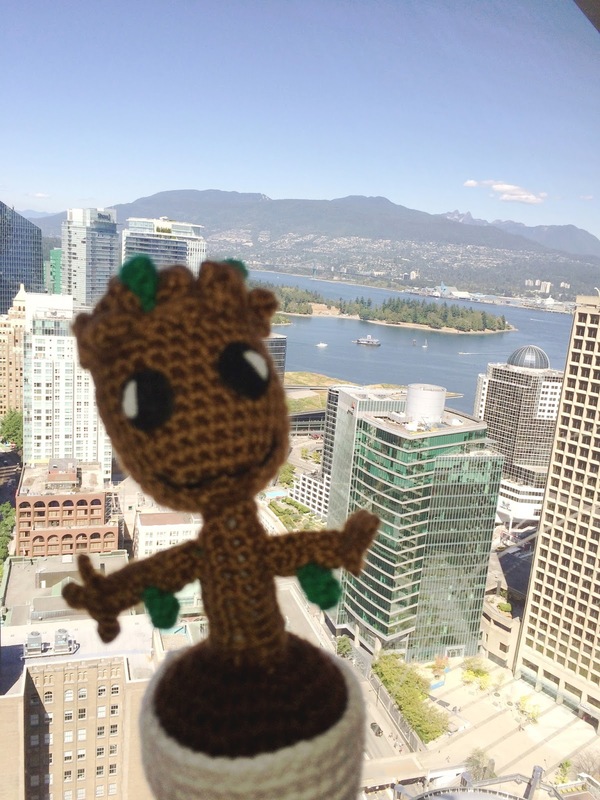 A more detailed photo of downtown Vancouver – Groot’s checking out the lay of the land! Next it was off to Gastown and the Steam Clock. Gastown is the oldest part of downtown Vancouver and is the original townsite from the 1870s. The steam clock is actually much newer, which I just learned from research… I always assumed it was fairly old, but it was built in the 1970s. It’s one of only 6 steam clocks in the world, apparently! Every 15 minutes it goes off in a burst of steam and whistles, and can usually be found surrounded by tourists. Groot wanted a photo op with Vancouver’s steam clock! Next up we were off to FlyOver Canada, a relatively new Vancouver attraction located down at Canada Place on the waterfront. I hadn’t been yet and since we include tickets for it in our tour packages sometimes I thought it was time to check it out. I’ve got a picture of Groot hanging out at the entrance below, but photos aren’t allowed inside so that’s it. Basically, FlyOver is a virtual flight simulation where you get to ‘fly over’ Canada from the coast of Newfoundland to the coast of British Columbia. It takes about 30 minutes in total including the pre-show portion/introduction, with the ‘flight’ itself coming in around 8 minutes. I’m wary of these kinds of things because I get motion sickness easily (even, or especially, if it’s simulated motion), but I was fine and I have to say it was pretty nifty! So check it out if you’re in Vancouver, but try to avoid mid-day when the cruise ships are in… we had to wait about an hour. We took a few photos from Canada Place as well, overlooking North Vancouver and the mountains. Cruise ship! Looks like a Holland America one, no doubt heading up to Alaska. We had planned to do a bunch more, but we were both tired and not feeling 100% so we decided to head to North Van and just chill at my place. Which means that Groot got to ride the Seabus! The Seabus links downtown Vancouver to North Vancouver in about 12-15 minutes. It’s largely a commuter ferry (I take it twice a day to and from work), but is also a great trip for tourists. For only a few dollars and a quick scenic boat trip, you’ll reach Lonsdale Quay in North Vancouver. From there, you can head up to popular tourist destinations like Capilano Suspension Bridge and Grouse Mountain, or explore other slightly less touristy sights such as Lynn Canyon (for a free suspension bridge and none of the tacky tourist stuff at Capilano! ), Deep Cove, and Lighthouse Park. Groot’s going on a boat! Looking back from the walkway that leads to the Seabus – there’s Harbour Centre/Vancouver Lookout, where we were earlier! 15 minutes later we arrived at Lonsdale Quay, a marketplace on the waterfront overlooking downtown Vancouver. If you want to get a picture of the Vancouver skyline, you have to come to North Van! I’ve been going to Lonsdale Quay my entire life (check out Dex’s Burgers in the food court – one of my favourite quick burger places in the city, it’s affordable, fast, and fresh, and I’ve been eating there since I was a kid). As a child it was an exciting treat to visit, and now I pass through it pretty much every day on my way home. Lots of fresh produce, meats, seafood, and bakeries, plus random shops scattered throughout. It’s lovely to sit outside on a nice sunny day, there’s always buskers and lots of activity. And a farmer’s market on Saturdays in summer! Vancouver skyline in the background. This picture didn’t turn out well, unfortunately… too much sun.